In 1966, eight women, all elementary education majors at Eastern Mennonite University (EMU), started a circle letter after graduation. 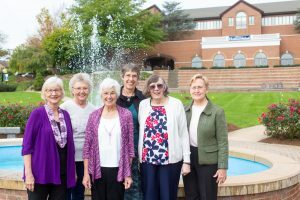 Nearly 50 years later — after moves, weddings, births and other significant life happenings — six of those women traveled from four states to reunite at EMU’s Homecoming and Family Weekend Oct. 14-16. The six friends (see photo below at right) were among nearly 600 alumni who came to the Harrisonburg campus to reunite, make new friends, enjoy arts and athletics events, and revisit favorite places on campus. Alumni who registered for the weekend came from 20 states and two countries, representing classes from 1956 to the most recent graduating class of 2016. View a photo album, watch TenTalks, and read inspirational words from EMU’s distinguished alumni honorees. Shank said the weekend’s new events, such as the Friday night a cappella concert and Saturday’s Fall Festival on the lawn, provided students, alumni and parents more opportunities to gather and interact. The new “EMUTenTalks” with its tagline Impact. Influence. Inspire. highlighted this legacy. Based on the popular TED Talks, the event featured Shirley Showalter ’70, author and president emeritus of Goshen College; Leonard Dow ’87, lead pastor at Oxford Circle Mennonite Church in Philadelphia and board vice-chair of Mennonite Central Committee; and Erik Kratz ‘02, professional baseball player. Six of the eight women in the Class of ’66 who started a circle letter that continues today; Sharon Kandel Yoder, Miriam Bauman Allison, Dolores Godshall Bauman, Lois Moyer Longenecker, Peggy Halteman Blosser, and Barbara Mosemann Penner, Carol Layman Parks and Anna Lois Longacre Lind were unable to attend. About 50 people gathered at the Chamber Singers reunion Saturday afternoon to honor Professor Ken J. Nafziger, retiring at the end of this year. Many returned the next morning to provide the final selection of Sunday’s worship service, singing “Dona nobis pacem” [Grant us peace], a canon by Johann Sebastian Bach. The Homecoming worship service celebrated the contributions of Alumnus of the Year Harvey Yoder ’64, Distinguished Service Award recipients Donna ’69 and Wayne ’67 Burkhart, and Outstanding Young Alumna Grace Praseyto ’10. In athletics action, EMU field hockey battled Virginia Wesleyan, women’s soccer lost 3-0 to Roanoke College, and men’s soccer drew a tie with Guilford in the final game of the day. At the field hockey game, Hall of Honor inductee Jonalyn Denlinger (2002-05) was honored in a halftime ceremony. An All-American in 2004, Denlinger was a four-time All-ODAC First Team and NFHCA All-Region honoree. She was inducted into EMU’s Hall of Honor earlier in the day, along with track All-American Megan Mlinarchik (2004-06).